Alex McLeish is apparently on his last legs as Aston Villa manager and even if he is able to keep them in the Premier League in the games that remain this season he is likely to be sacked in the summer. The betting line coming out of Villa Park are suggesting the board and owner, Randy Lerner, will bow to fan pressure and dispense with the unpopular Scot when they can. If and when he does go, some will view McLeish, considering his experience and past achievements, as a tad unlucky not to be given more time in the Villa hotseat but others will - quite rightly - argue that this was a relationship always doomed to fail. It would be kind to suggest the former Rangers boss got a 'luke-warm' reception from the Villa faithful in the summer after what was a surprise appointment. The fact he left a sinking ship in local rivals Birmingham where, despite relegation, he was respected after winning the Carling Cup, to make the short move to arch-rivals Villa was never going to sit easy with the die-hard fans. In fact plenty of them made it clear they did not want him in charge full stop because of his Blues connections and demonstrated at Villa Park upon his arrival. Other fans were prepared to give him the benefit of the doubt and a couple of early wins bought him time. However, as results gradually got worse and performances hovered around average at best and woefully inept at worst, fans grew more and more unhappy with seemingly negative tactics and made it clear the new manager was already on borrowed time. A shocking run of results has now plunged McLeish's side into the relegation scrap and the fans, pretty much to a man, have now turned big-time on the former Birmingham chief and want him sacked. This anger and lack of backing will not help their cause in the run-in and Lerner has vowed to stick with 'Big Eck' until the end of the season at least, but I wouldn�t mind betting he will go at the end of the campaign even if they do stay up - he looks a dead man walking. The problem has been obvious really, McLeish barely had the support of fans right from the start, and now the vast majority have turned against him he simply has no chance. As has been seen time and again when you lose the fans, you're position usually becomes untenable. 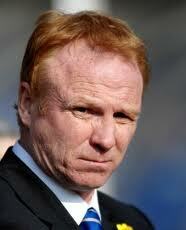 Sadly for McLeish he has been playing a losing game since taking over.